Korean-style things are are really extraordinary. For example, roof tiles, eaves, and the big earthenware jars called jangdokdae have a natural and unchanging aspect to their appearance, yet they also have hidden scientific features that are largely unrecognized. The fourteen-sided dice called juryeonggu, which may appear to be like any random paving stone on the roadbed, is also infinitely mysterious and marvelous. 01 | What is a juryeonggu? At the royal palace, where ponds were created to attract rare and precious birds, it has been found that royalty of the Silla era played games with juryeonggu. 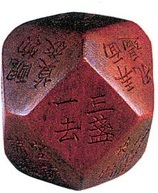 An example of the juryeonggu, a kind of dice with 14 sides (a cuboctahedron), was found at Imhae Jeonji (Anapji) in Gyeongju, where royalty used to spend leisure time. Containing the three characters 酒令具, respectively signifying ‘liquor,’ ‘command,’ and ‘tool,’ the word juryeonggu could be roughly defined as ‘device for drinking games.’ In 1975, a wooden juryeonggu made of oak was discovered. The secret of the 14 sides. How can you create a form with 14 sides? Conventional six-sided dice are cubes, composed of six perfectly square faces. The 14-sided juryeonggu, on the other hand, is composed of six squares and eight hexagons. When you roll conventional 6-sided dice having six sides of equal shape and size, the probability of any one side showing is the same: 1 in 6. What about the probability for the 14-sided cuboctahedral juryeonggu? The probability is also equal, 1 in 14, because amazingly the areas of the squares and hexagons are almost the same, with only a very slight difference. To enhance guests’ pleasure at feasts that featured drinking, the juryeonggu was a contrivance inscribed on its fourteen sides with the rules for EumJuGaMu (a term signifying food, drink, song, and dance). What kinds of games were played by Silla people when they gathered for drinking and revelry? As glimpsed through the lens of juryeonggu, the Silla people can be seen as both elegant and mischievous. Now it’s my turn. You, roll the juryeonggu. Finish an entire cup and laugh out loud. Ha ha ha, ha ha ha! What are you waiting for? It was Eum-jin-dae-so, wasn’t it? Come, laugh out loud, all of you. Juryeonggu was seen in episode 6 of the MBC historic drama “Queen Seondeok” in 2009. King Jinpyeong of Silla is known to have played the ‘juryeonggu’ dice game when enjoying EumJuGaMu (food, drink, song, and dance) with his vassals. When it was the king’s turn, a court lady tossed the dice for him. In this case, ‘Eum-jin-dae-so’ came up. The king drank a cup of wine and laughed loudly, according to the rules. You can make your own paper juryeonggu by drawing the correct shapes on a piece of paper, or by printing the attached file. Make yourself a paper juryeonggu and try tossing and playing the juryeonggu game at school, work, or gatherings. Just cut along the lines and glue the dotted sections together. 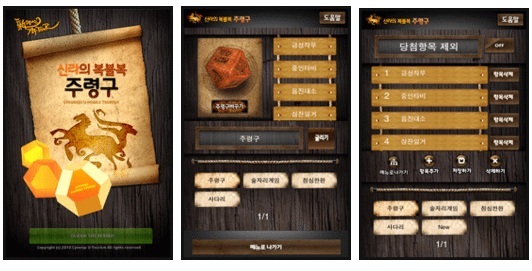 Juryeonggu is also available as an application for your smartphone. In addition to the fourteen drinking commands enjoyed by the people of Silla, a variety of juryeonggu games are available, including fun stuff like Bok-Bul-Bok variations (Bok-Bul-Bok refers to a “luck of the draw” system). For example, there is “What’s for Lunch? Bok-Bul-Bok” to select a lunch plan, or “Who’s Gonna Treat? Sadari Bok-Bul-Bok” a ladder-based system to determine who will pay. But, the true attraction of the Juryeonggu App lies in its ‘DIY’ do-it-yourself possibilities. Devise your own juryeonggu game according to your own whims. If you usually agonize over what to wear every morning, create a Bok-Bul-Bok device featuring fourteen outfits inscribed on a juryeonggu. If you and your friends struggle over dessert plans, play Bok-Bul-Bok by entering everybody’s favorite desserts, and go along with the random results. Add convenience and fun to your life The juryeonggu application is available as a free download at the iPhone App Store or Android Market. Just enter ‘주령구’ (juryeonggu in Hangul) in the search box. 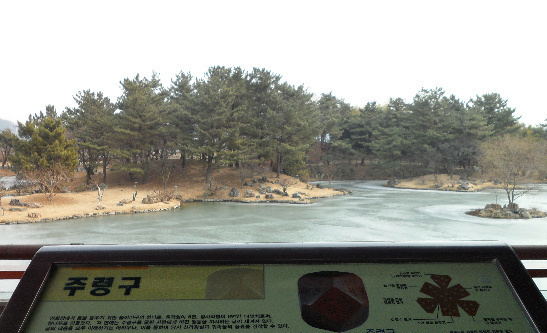 The juryeonggu was found at at Imhae Jeonji (Anapji Pond), where Silla kings enjoyed merrymaking and leisure. Wouldn’t it be fun to stand on that actual historical site? Why not come to Anapji to play with your own homemade juryeonggu? After it was found, the original juryeonggu was damaged during the drying process, and so a replica was produced. It can be viewed in Anapji Hall at Gyeongju National Museum. At Gyeongju World Culture Expo Park, you can take a memento photograph against the backdrop of a giant human-sized juryeonggu. Does anyone know the dimensions of the hexagon of this interesting, and important polyhedron? Does anyone know where I might find a dice like this to buy online?